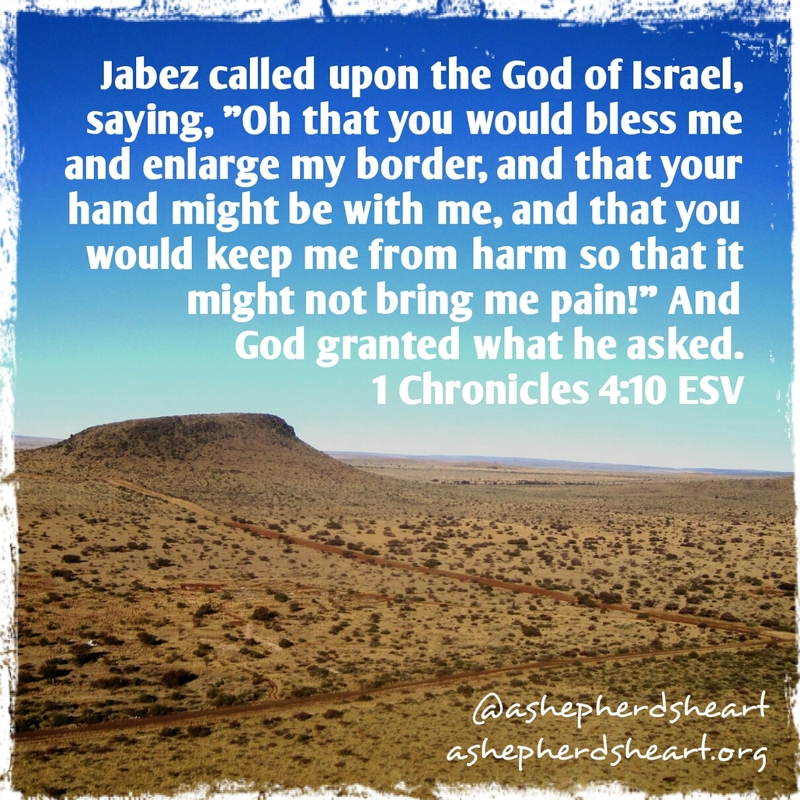 The prayer of Jabez is a simple but very poignant prayer full of faith, however, to be very honest, it's not one that we should be superstition about thinking that just by speaking this amazing prayer or any prayer that God will do exactly what we ask. It should however expand our prayer life and faith in God's provision and goodness! What I find is that we can often over-spiritualize or become superstitious about things like prayer thinking if we say or do certain things that that's the ticket to blessing or to release God's "bank account" upon us. Some even go the length of teaching or believing that if you give a certain amount of money to specific people or ministries that that will be the key to shower God's blessings multiple times because of that giving. I'm not talking about tithing as that is between you and the Lord as a cheerful and sacrificail giver but I'm talking about the gifts over an above that you may give thinking it will somehow increase the blessings. No doubt God wants to bless His people in one way or another and He does bless a cheerful and sacrificial giver, but, it's not always in ways that we consider grand displays, rather, there are blessings every day through the gift of life itself and yes, there are blessing of material things too but not as often in the grand fashion that some espouse. Some also move into equally dangerous territory and are taught and believe that they can "name and claim" or "declare or decree" whatever they want but there again...only according to God's will does He provide answers to prayers and provision. In all these before mentioned things, what happens to the faith of those who do these things and then God's answer is NO? "But I prayed, declared or gave a certain way or amount...why didn't God provide what I wanted? Again...you have to ask, was it God's will? Obviously faith should be built on more than what God can potentially bless us with. It should be built on the solid ground of Who He is and Who He sent to be our salvation. May our prayers be Biblical and full of faith knowing God is good and knows what's best for us and He will answer according to His great and loving will! 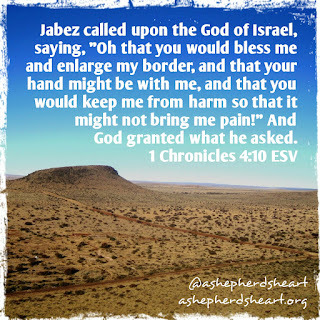 As we approach the prayer of Jabez we need to see it as a man who prayed a prayer of great faith and that God answered according to His will and in turn we should pray prayers of great faith. Furthermore, we should learn from the great faith of Jabez and we in turn are again to have great faith in God and believe in faith as we pray but bearing in mind that it's only according to what God's will is that we will receive what we ask for. On another related note, maybe you're afraid to pray because you feel as if you're not worthy of God's blessing or time? News flash...none of us are but thanks to Christ you and I have been adopted as sons and daughters and God does want to bless you and has in many ways...so...why not pray Jabez size prayers and let God's will become clear? Don't allow fear to keep you from communicating with your loving Father as He already knows your heart and wants to hear from that heart and mind of yours. So, with great faith and confidence pray great prayers, dream great dreams of all God potentially has in store for you, pray through the scriptures, ask whatever you want of the Lord but balance your expectations and leave the answer to Him because the answer to all your prayers is up to Him as it's according to His will, purpose and plan and not our own.